Location/Size: National park, 3,716,000 acres (96 percent federal); national preserve, 374,000 acres (100 percent federal); designated wilderness, 3,473,000 acres. At the head of the Alaska Peninsula, 250 miles southwest of Anchorage, 100 miles northeast of Kodiak. Main Activities: Bear viewing, fishing, canoeing, kayaking, volcanic sightseeing, backpacking, backcountry lodging, mountaineering, sea kayaking. Gateway Towns/Getting There: King Salmon/scheduled air service from Anchorage; Kodiak/scheduled air service from Anchorage, scheduled ferry service from Homer and Seward; Homer/vehicle access via Sterling Highway (AK 9), scheduled air service from Anchorage, regular ferry service from Seward. 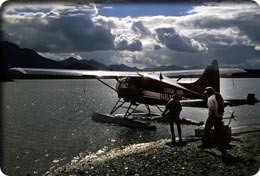 Park access: floatplane to Brooks Camp and other lakes and sheltered coastal waters; by water to Brooks Camp via Naknek Lake; charter air service to drop-offs from Homer, Kodiak, and Anchorage; road access from Brooks Camp to Valley of Ten Thousand Smokes. Facilities, Camping, Lodging: Bear-viewing platforms at Brooks Camp. Road from Brooks Camp to Valley of Ten Thousand Smokes, short trails at Brooks Camp and Valley of Ten Thousand Smokes. Brooks Camp Campground, Brooks Camp Lodge, other park lodges, private lodges on private land inclusions, primitive camping elsewhere. Headquarters and Information: Headquarters, P.O. Box 7, #1 King Salmon Mall, King Salmon, AK 99613, 246-3305, www.nps.gov/katm; Kodiak Ranger Station, 486-6730. Katmai is perhaps the most fantastic of Americas national parks, offering a combination of vast wilderness, active volcanoes, and the best bear viewing on the planet. The park is a haven for red-salmon fishers. Several large lakes offer routes for stillwater explorers, including the combined 100-mile length of Grosvenor, Naknek, and Brooks Lakes, linked by two short portages. Good hiking routes can be developed using the open lunar landscape of the Valley of Ten Thousand Smokes. The Alagnik Wild River and other river-running options are served by guides and outfitters in King Salmon. 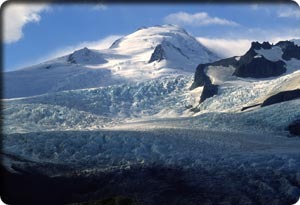 Mountaineers will gain rewards of volcanic proportions by attacking summits via glacier or ridge. The brown bears of Katmai and nearby McNeil River are fast exceeding those of Kodiak in fame. Kodiak bears grow larger than their mainland kin, but the Katmai bears are impressive enough and easier to view. Most have known an extended period free from the threat of hunting and are not the least bit skittish over the presence of suitably respectful humans. 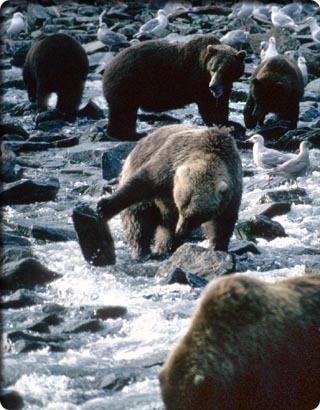 Bears gather about key stretches of spawning streams in groups large and small to feast on the doomed fish, caring little for clicking cameras or the angler casting a line 100 yards upstream. Of the 400 or so major volcanic eruptions that have been recorded in historic times around the Pacifics "Ring of Fire," an amazing 10 percent have been in Alaska. Most of those have occurred in the Aleutian Mountains of the Alaska PeninsulaKatmai is home to 15 of the states 70 active volcanoes. The last major eruption was in June of 1912 when Novarupta Volcano blew, providing the impetus for the creation of Katmai National Monumentcore of the current park. Several of Katmais volcanoes emit occasional plumes of steam. Mount Trident has erupted four times in recent decades, most recently in 1968. Trident and Novarupta both appear to share a magma source with Mount Katmai, the splendid namesake of the park with a gorgeous crater lake. The park concessionaire is Brooks Lodge, a division of Katmai Land, Inc. They operate Brooks Lodge at Brooks Camp ($320 for a room, up to four people), Grosvenor Lake Lodge, Kulik Lodge on Novianuk Lake, and two smaller facilities. For reservations, call (800) 544-0551. Reservations for the 60-site campground at Brooks Camp are necessary and can be made through Biospherics at (800) 365-2267; sites are $5. Primitive camping is permitted anywhere in the park and preserve, except on private inclusions and within 5 miles of short, critical stretches of bear habitat near Brooks Camp. Katmai is contiguous with Becharof National Wildlife Refuge to the southwest and the McNeil River State Game Sanctuary. Together, they offer one of the longest continuous stretches of undeveloped shoreline on the Pacific Coast. Visitors typically take a floatplane shuttle from King Salmon to Brooks Camp (see the Appendix). Kodiak and Homer are the best gateways for shuttles and flightseeing to the Katmai coast. There are no food or supply sources in the park other than the beds and prepared meals offered at the lodges. This small national park enclave is the heart of Katmai and the base of operations for most visitors. Brooks Camp is situated where Brooks Lake drains into Naknek Lake via the short Brooks River. Salmon struggle from one lake to the other via the cascading waters of Brooks Falls. Fishers work the Naknek lakeshore and Brooks Riveras do numerous brown bears. Designated spots for optimal bear viewing assist photographers. Rangers insist that all viewers and fishers follow carefully crafted guidelines for behavior around the bears (resulting in an outstanding safety record). Unlike McNeil River, the number of visitors here is limited only by the capacity of the air-taxi services (this may soon change), though both the Brooks Lodge and Brooks Camp Campground require reservations. You may be able to time your visit to enjoy Brooks Camp bear viewing without actually having to stay there. Backcountry explorers can spend part of the day at Brooks, then take a shuttle to camp at the Valley of Ten Thousand Smokes (see below). Water travelers and hikers can head down the lakeshores for lonely campsites away from the action. Air taxis and outfitters serving Brooks Camp are listed in the appendix. When Novarupta Volcano erupted in 1912, it spewed huge amounts of volcanic ash over the landscape, affecting the atmosphere over the entire Northern Hemisphere. Ash clouds caused blackout conditions in Kodiak, while damaging acidic rain fell as far away as Vancouver, British Columbia. Nearly a billion tons of ash, pumice, and debris settled over the upper Ukak River watershed, covering more than 40 square miles with a layer as deep as 200 meters. Shortly after the eruption, thousands of vents and fumaroles sent steam plumes into the air as seeping waters met the hot debris, earning the region its name. erosive process that will disperse the great ash field in a geologic eyeblink. Explorers can easily choose routes across the relatively unvegetated surface of the region, though venturing close to cliff edges and attempting certain stream crossings is foolish because of the loose rock. Brooks Lodge operates a shuttle bus on the 23-mile road between Brooks Camp and the valley: $42 one-way, $79 round trip, (800) 544-0551 for information; reservations recommended. A trail leads down to the valley from the viewpoint at the end of the road from Brooks Camp, but no developed routes into the park interior exist.